The Meteors were a Dutch rock band that was mainly active from 1977 to 1982. The group was established in the autumn of 1977 founded by Ferdinand Bakker (guitar), Job Tarenskeen (drums), both in Alquin had played, and singer and songwriter Hugo Sinzheimer. The first line up of the band also included the Swede Ake Daniëlson ( keyboards ), John Vee (pseudonym of Jan Voster, bass) and Erik de Zwaan (guitar). Tarenskeen, Vee and De Zwaan left the group in 1979. Kim Haworth (drums) and Gerrit Veen (bass) took their place. The Meteors released three LPs, Teenage Heart (Bovema-Negram 1979), followed by Hunger (Harvest 1980), and Stormy Seas (CNR 1982). The Meteors was successful in the Dutch club scene and belonged to a generation of rock bands who were part of the Dutch version of New Wave . 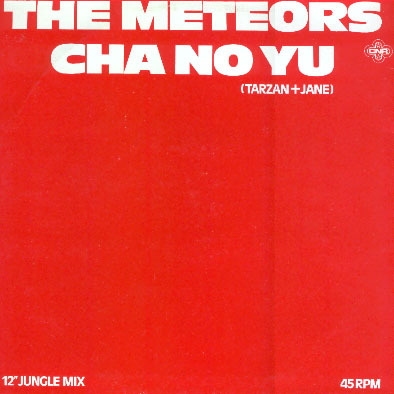 From the band’s final album comes the single “Cha No Yu (Tarzan & Jane) with an early remix from Ben Liebrand.